Welcome to the California Women Lead LEADership blog! We hope this blog inspires you as you navigate your leadership journey – personally, professionally and politically. This blog focuses on the positive impact female leaders have. We hope to provide tips and ideas on being an effective and influential leader and we welcome your input and suggestions. We will also highlight women leaders and their personal leadership journeys. More on how to share your leadership journey later! This blog kicks off at the same time we kick off our new program – our statewide LEADership Academy. These twelve one-day trainings inspire female leaders – personally, professionally and politically, and tackle important policy issues facing the state. It is our hope that this Academy will foster new relationships and showcase the diverse network of women leaders in California. We hope you find this blog and our new Academy useful in your own leadership journey! We have all had that feeling – the pit in the bottom of your stomach; the little voice saying “you can’t do that, so don’t even try.” The fear that comes when you are standing up for something you believe in, but you don’t know how others will react. Leadership can be scary! Have you ever second guessed yourself; thought no one really wants to know what you think; your voice does not matter? That is the exact moment when we need to stand up and lead. Good leaders get uncomfortable, great leaders push the envelope for the greater good. All leaders experience fear, but what separates the good from the great is how a leader faces that fear. Do they embrace it and become a better leader or do they let fear consume them, freezing their ability to power through. It is okay for leaders to be afraid, everyone at one time or another is scared, but what will you do next time that little voice pops up full of fear? Will you let fear overcome you, silencing your voice, or will you look fear in the face, figure out what it entails and meet it head on. When you look fear in the face and power through it you are well on your way to becoming a great leader! During the 2016 Election Cycle we heard a lot about “fake news”’ “media bias,” etc. Regardless of what side (if any) you were on, this became one of the issues everyone seemed to agree on! We are lucky, access to news and a variety of viewpoints runs rampant in today’s society, but access to so much information can be both a blessing and a curse. This puts the burden on all of us to do our own research, gather and verify from various sources so we can draw our own conclusions. Access to the Internet and social media outlets can be a great thing. Reading about a candidate, campaign or issue while waiting in line for our morning coffee can be a great distraction, but when people choose to forward information or comment about it on Facebook without doing their own research and due diligence, it can become a curse and begin to eat away at relationships as well as the very fabric of our democracy. This is where good leadership comes in. Good leaders want folks to have solid facts. Good leaders strive to empower folks in their networks to form their own conclusions, based on fact, not fiction. Sometimes, though, that is a tough leadership position to be in, but a very necessary one. a shame that, due to the fire hose of information that is thrown at us on a daily basis, people are no longer taking the time to research and make up their own minds and in this hyper-political world we now live in, we have lost the ability of constructive dialogue. Are you being a good leader to your networks? 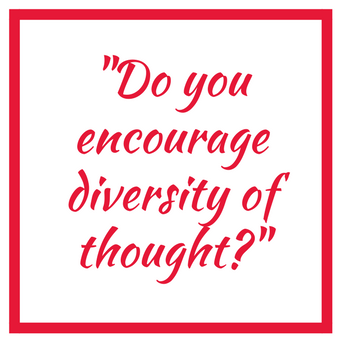 Do you encourage diversity of thought? Constructive disagreement, based on facts, can be a good thing! You can’t lead if you don’t have a plan. Most people want to be inspired, they want to be led – that is why they call it leadership. Good leaders understand that. They take the time to understand what motivates people, they work to find a common goal and they strive to make sure all voices are heard. As you move through your leadership journey are you leading with meaning? Do you invest the time in finding how your networks want to be led? Do you listen? Some leaders assume the best way to be successful is to lead with an iron fist. They think that by pushing their personal agendas and implementing their personal vision others will follow. More often than not, that does not work – people do not follow, they rebel! Good leaders understand their role is to listen, ask questions, and solicit input and ideas to form a collective vision and then work to ensure all team members have a role in its implementation. When groups share a common, meaningful goal with leadership that is inclusive, where all voices are heard and valued – great things can happen. Remember the saying “when life gives you lemons, make lemonade.” In leadership, that proves to be a great saying, especially when your leadership journey does not go as planned! Effective leaders need to master the art of the pivot. They need to know how to adapt and change course. Good leaders understand that when you have people looking to you for leadership you have to have a plan and a style that is nimble enough to bend should circumstances change. When things start going off course or outcomes are not what were expected, good leaders know how to motivate, inspire and move course strategically for a better outcome. One of the biggest leadership obstacles facing us in our leadership journey is that little voice inside – telling us “we can’t do this, we’re not qualified, we’re a fraud.” What do you do when you hear that voice? Do you let it infiltrate and take hold, which in turn breaks your confidence and adds to your insecurity? Or do you face that voice, stare it down and move forward. One of the best ways to combat that feeling of insecurity is to write down your leadership journey and see where your path started and how far you have come. So often we get caught up in our day-to-day life, and we forget what challenges we overcame to get to the position we are in. As we look back on our journey, we realize we are more qualified than we thought and we have every reason to be in the position we are in. We are NOT a fraud! Sometimes being a leader is lonely. Sometimes a leader has to take a lot of attacks, backstabbing and just plain nastiness. It can be hard, it can be hurtful especially because deep down we all fundamentally want to be liked. No one said leadership is a popularity contest! Effective leaders push the envelope, they push their teams to places they never thought they would go. They make tough decisions that may be unpopular, but are for the greater good of the organization. Sometimes that can lead to a lonely place. What do you do when you find yourself in that lonely leadership position? When you start to wonder if you are doing the right thing? First, believe in yourself. Look deep down, and if you are leading from authenticity, know you are making a difference. It may not feel that way right now, but at some point you will look back and know your leadership made a difference. Second, find your “kitchen cabinet.” Take time to surround yourself with a support system that lifts you up when you are feeling down, when you feel like you are being attacked. Find people who will encourage you when you feel like giving up and throwing in the towel. People who will remind you that you are making a difference being the leader you are! After the 2016 Presidential election, folks had a lot of questions. How did this happen? What will happen now? Did people know what or who they were voting for? Why? Why? Why? There was a huge spotlight on the presidential candidates. We learned about their emails, their twitter feeds, the Electoral College, how party primaries really work (or don't work), fake news and the list goes on and on. Take a moment and think about your local community – did you pay attention to local issues? Did you know who the local candidates were? Do you know which local candidates were elected? Did you attend a local candidate’s forum? Local candidate coffee or city council/school board/board of supervisors meeting? Do you know who your local elected representatives are? While we all need to pay attention and understand what goes on in Washington DC or Sacramento, we really need to pay attention to our local communities and local leaders – it is good for us personally, professionally and politically. Maybe you are a local official or maybe you will be one day, but being involved and being an educated citizen is one of our most fundamental duties as a leader.